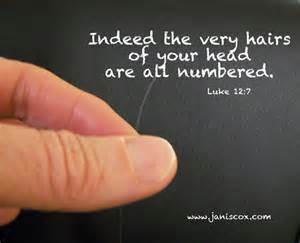 Big deal – so God knows how many hairs I have. I’ve never understood why Jesus even bothered to say that? But this week, all of a sudden, Jesus’ words as recorded by Luke stopped me cold. I realized that I myself don’t know THAT fact about my hair. What else don’t I know about myself? And what kind of God must our creator be to have that kind of detailed knowledge? And if he is always aware of the minutia of my life, then he must be intimate with everything else about me, to include the really big stuff. Suddenly it made sense that God cares enough to keep up with everything about me. Don’t I care about what I fashion? Don’t I feel a sense of pride and affection and a close bond with my grown sons? And I didn’t create them, I ‘merely’ raised and loved and taught them. I like this now, that my heavenly Father knows even the tiniest FACT about me before I ever notice. That feels like love. And in the preceding verse (Luke 12:6) he even says that I’m way more important than sparrows. And the level of care he shows to these common birds is phenomenal. Not a single one is “epi-lanth-a-no-mai” – that is forgotten, neglected or uncared for. If that is how our heavenly Father takes care of the animal kingdom, then how much more valuable am I or are you? Hmm….so how should I treat my neighbor, whom this same God also created?